As Hibs return to the Premiership with lofty ambitions, the ongoing conundrum surrounding Dylan McGeouch’s fitness is brought more sharply into focus. The 24-year-old midfielder is blessed with a level of quality and composure that allows him to dictate games like no other player at the club. Fully fit and firing, it is widely acknowledged that he would be considered their main man – indeed there are plenty supporters who already view him in this light regardless of the well-documented injury problems that have plagued him throughout his three years at the club. 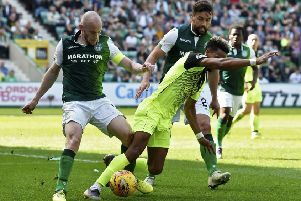 The benefits of having such an accomplished player, however, have been largely offset by the fact his body has been so susceptible to niggles that he has been able to start only 21, 24 and 16 games, respectively, in each of his three seasons in the second tier with Hibs. McGeouch, whose contract expires next summer, has been the subject of speculation recently, with Blackpool credited with an interest. However, supporters were given an early-season reminder of his quality when, for almost an hour, he controlled last weekend’s Betfred Cup stroll against Montrose. It was notable that his team’s sense of fluency faded after he was substituted in the 57th minute. The situation is exasperating for Neil Lennon. Instead of being able to build his team around the deep-lying playmaker, the manager, who worked with a teenage McGeouch at Celtic, is unable to hang his hat on him being available for the lion’s share of games over the course of a season. “Neil must wish he had a crystal ball to know how many games he was going to get out of Dylan,” said Kevin Thomson, a pundit and midfield colleague of McGeouch’s at Hibs in the second half of the 2015/16 season. “The figures from the last few seasons suggest he’s only going to get about 20 starts, and, from a manager’s perspective, it’s obviously a big issue if a player is going to be spending a lot of time in the treatment room. Even though Dylan’s a good friend of mine, it would be a gamble to pin all your hopes on him being fit enough to play 40 games a season – and Dylan will probably know that himself. John McGinn, the Scotland international midfielder, is widely deemed to be Hibs’ most prized asset, but Thomson is adamant that McGeouch would be spoken of in the same breath as his midfield colleague – and previous headline-grabbers like Scott Allan and Jason Cummings – if he hadn’t been so hindered by injuries. “Hand on heart, I think he’s one of the best players at the club, if not the best,” he said. “I know John gets a lot of the plaudits, and rightly so because he’s a powerhouse. You could argue Dylan probably doesn’t drive the team on in quite the way John does, but when it comes to dictating play, setting the tempo and controlling the game, Dylan does that as well as anyone. It’s a fine art, and sometimes it’s not fully appreciated. “Dylan’s not big and he doesn’t look powerful, and isn’t one who is going to brush past people with his physical attributes, but he’s still got that change of pace where he can stop the ball and drive, a bit like Scott Allan does. You’d never think he was fast, but he can drop the shoulder and accelerate away from people really well. “I don’t want to sound as though I’m dissing John, but I genuinely think Dylan’s the best player at the club. John is a different type of player and he’s right up there, but what he’s had over Dylan is being able to play consistently week in, week out over the last two years. Dylan’s 24 now so he’s probably passed the line where he’s no longer considered a young player. When you carry injuries, you’re never going to be viewed as much of a sellable asset compared to someone who’s playing to a similar standard over 40-45 games a season. If he was able to play 40 games this season, I think Dylan could potentially become the benchmark for midfielders in Scotland. Thomson believes McGeouch’s presence makes Hibs a far easier-on-the-eye team. “Hibs are a better side when Dylan’s in it,” he said. “If they want to pass the ball through midfield and pass it forward with penetration, Dylan’s a key element to that. When he plays, they have to pass the ball through him because he demands it. McGeouch’s Hibs career was symbolised by the moment he injured himself and prematurely ended his season while bursting forward to score a sublime equaliser in the Scottish Cup semi-final defeat by Aberdeen three months ago. Thomson became something of a kindred spirit to McGeouch since he had also been plagued by niggly injuries, albeit his materialised later in his career. Indeed the 32-year-old gave his former colleague a pep talk on the eve of the Scottish Cup final last year to ensure he was in the right frame of mind to play against Rangers after pulling up injured in the play-off defeat by Falkirk a week earlier. Thomson, who retired last year due to the toll minor strains were taking on his body, is hopeful that McGeouch can finally overcome his recent injury torment and enjoy the first fully-fit campaign of his senior career. “If I was ever Dylan’s manager I’d like to think I’d be understanding of his situation in the respect that you can’t help getting injured,” said Thomson. “When a player is injured, it’s more frustrating for the individual than for anyone else. Some people think players like to be injured, but that’s rubbish. You spend long hours in the treatment room, you play less, you get paid less, and it’s generally the lowest times of your career, whether it’s for a few weeks or several months. “I helped Dylan through whenever he was down about his injuries and I’d like to think I was probably as good as anyone for him to speak to in the respect that I had plenty myself. I tried to give him as much advice and comfort as I could to try and keep him on the straight and narrow and keep his mind as positive as possible. “Even though I had some serious injuries, I don’t think I pulled a muscle until I was about 26.